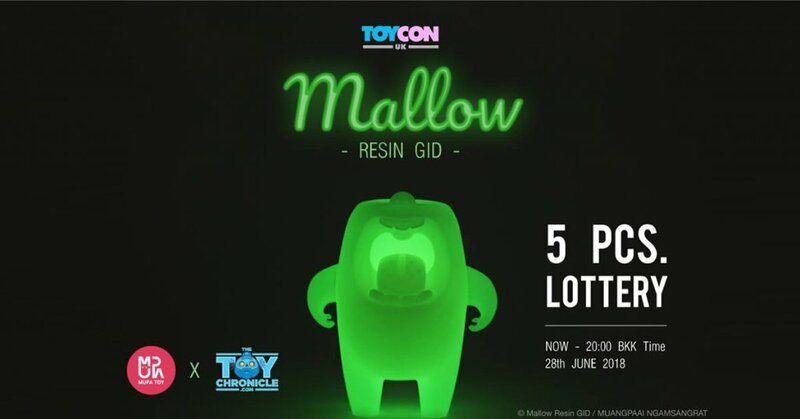 Mallow resin GID edition by MUPA TOY comes back !! Better late then never right? MUPA TOY had an exclusive for us at The Toy Chronicle at ToyCon UK and 5 pieces were reserved for a Lottery for collectors who couldn’t make it to ToyCon UK. Did we fail to mention its GLOW IN THE DARK! LET US HEAR YOU SCREAM! Standing and screaming at 3.3 inches comes with stickers and magnetic arms so Mallow is easily posable. Don’t worry he doesn’t bite all he needs is a little love. Comment with the comment ” 1 ” on the photo seen above on MUPA on Facebook. – Each person can comment only once. Mupa Toy has added a storyline to the release and oh my that explains the epic expression, HA HA we had a good laugh. Check out our review of Mallow below. Cop your Designer Toy news first, you should look to download our new TTC Mobile App. Designer Toy news direct to your smartphone. No dealing with social media algorithms. Go check out MUPA on Facebook & Instagram.